Seated Liberty Half Dimes with Legend The end of a series. 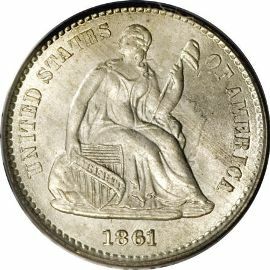 Seated Liberty Half Dimes with Legend were coined at the US Mint from 1860 to 1873. These small silver coins represent the final design change for the half dime as it gave way for the Shield Nickel in 1866. The two coexisted for seven years more, but finally the half dime was discontinued. 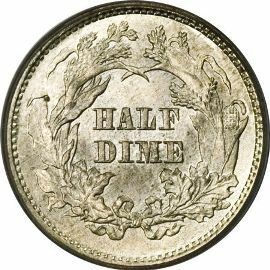 In 1860 Longacre redesigned the half dime once more. The new design became known as the Legend Obverse type. AMERICA" replaced the thirteen stars that had surrounded Liberty on earlier versions. The simple, laurel wreath was discarded and replaced by an elaborate one made up of sprigs of wheat, corn, oak and maple leaves. The wreath is tied with a bow at the bottom. The denomination "HALF DIME" appears inside the wreath.